Hi everyone! Kathleen here! I’m just back from an amazing weekend in the lovely city of Montreal! It was our first time visiting and we just loved it. We took the train from Toronto so that we could see a bit of the Canadian countryside. The journey was four hours long and we had a blast! The seats were super comfy and there was lots of leg room for those taller folk among us! The scenery was great and we seen lots of gorgeous rivers, lakes and cute little towns! The train journey was a nice alternative to a flight and the drive to Montreal from Toronto is also known to be very scenic! 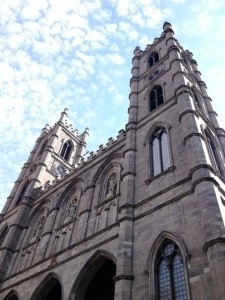 We arrived into Montreal at lunch time and our hotel was a quick five minute taxi ride away. We stayed at the Best Western Plus Europa on Drummond Street and the location was ideal. We were a 30 second walk from the main street in Downtown Montreal. The hotel offers free wifi and the room was clean and very comfortable. 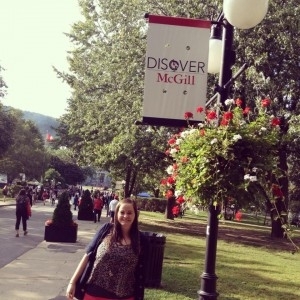 After dropping off our bags, we made our way down the main Downtown street ‘St Catherine’s’ to McGill University. My co-workers who studied their advised the campus was worth a stroll around and they couldn’t have been more right! It was stunning! Flowers, old buildings and hundreds of happy students filled the grounds. The campus is a must visit for a nice stroll on a sunny day. 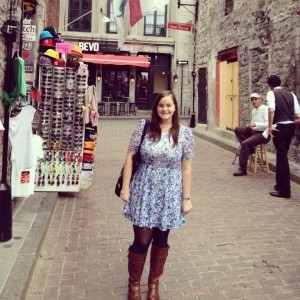 On day two we rambled around Old Montreal. You can get a subway to the Old Town but for convenience we hopped into a taxi and it was about a ten minute drive from our hotel. It cost $10. Old Montreal was gorgeous! Cafe’s and quirky shops line the cobbled stone streets and it’s also set on the water front! This area of the city was gorgeous and we really felt we were back in time. The Notre Dame Cathedral is located here and is well worth a visit. The inside was like nothing I’ve ever seen. It was so extravagant and beautiful. Not to mention, peaceful. There is a small cover charge of $5 to enter the cathedral but it really is worth it. Over the course of the weekend, we did a lot of eating, something that Montreal is famous for! When you visit, it’s a must to sample the local poutine, smoked meat sandwiches and the delicious crepes! Other attractions include the Botanical Gardens and the Old Railway Museum. The city was so nice and relaxing and I would highly recommend a trip to Montreal if you ever visit Canada, it will be so worth your while!